The Trump administration has reversed an Obama administration ban on the use of neonicotinoid pesticides and genetically engineered crops on national wildlife refuges where farming is permitted, threatening pollinators like bees and butterflies along with a suite of other wildlife species that depend on healthy, natural refuge habitats. This abrupt change in policy, announced via a U.S. Fish and Wildlife Service (Service) internal memorandum, revokes the agency’s 2014 policy prohibiting the use of toxic “neonic” insecticides and genetically modified organisms (GMOs) on refuges. 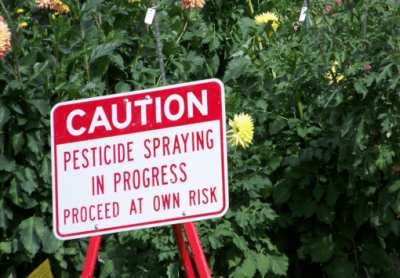 The 2014 ban was promulgated in response to a series of lawsuits challenging the use of genetically modified seed and broad-scale application of toxic pesticides on refuges for violating environmental laws. The new memorandum, signed yesterday by Greg Sheehan, the Service’s Principal Deputy Director, will require refuge managers to consider application of neonicotinoids and GMO seed on a case-by-case basis, in compliance with relevant laws including the National Environmental Policy Act and refuge policies. Not only does this place an undue burden on already understaffed refuges, but it disregards numerous scientific findings on the dangers of neonicotinoids and GMOs to wildlife and conflicts with Congressional mandates to maintain the biological diversity, integrity and environmental health of the National Wildlife Refuge System. Genetically modified crops are engineered to resist insects and herbicides, allowing for increased use of the latter to control undesirable vegetation. Intensive use of herbicides can kill native vegetation and significantly increase toxicity in natural systems, affecting birds, fish, mollusks, amphibians and insects. While the Service previously determined that the use of genetically modified crops was unnecessary for achieving refuge purposes, the new memorandum attempts to justify their use by claiming they may be necessary to provide additional feed for waterfowl and migratory birds and counter the loss of private farm land nationwide. Neither of these justifications is based on reality, science or professional wildlife management principles. The wildlife-first mission of the Refuge System includes all species, not just ducks, geese and other game animals (which are otherwise faring well without intensive agriculture on national wildlife refuges). The claim that the federal government needs to facilitate farming on refuges to compensate for lost farmland elsewhere is without merit and contrary to the long-established purpose of the System. The U.S. Department of Agriculture reported in February that 910 million acres are managed for agriculture. In comparison, approximately 100,000 acres of the Refuge System were farmed in 2017. Application of neonicotinoids on national wildlife refuges is even more dangerous than GMOs. Neonics are a class of pesticides implicated in declining pollinator populations around the world. Farmers spray this systemic nerve poison directly onto their crops or treat the seeds with the pesticide, which is absorbed throughout the entire plant. When pollinators, birds and other small animals are exposed it can lead to paralysis and death. These highly potent chemicals have been linked to devastating declines in bee populations, widespread contamination of streams and rivers across entire regions, and threaten amphibians, fish, birds and other wildlife. A growing body of scientific research suggests that neonics are one of the most persistent, prevalent and potentially toxic pesticides since DDT, which was banned in the U.S. in 1972. The new memorandum provides no justification for allowing the consideration of this poisonous pesticide on national wildlife refuges. Its use would harm a variety of species and violate a fundamental purpose of the Refuge System to conserve biodiversity. Farming is only allowed on national wildlife refuges when it supports specific conservation objectives for waterfowl and other wildlife that the Service cannot meet through the maintenance, management or mimicking of natural ecosystem processes in other ways, or where authorized in refuge establishment authorities. Cooperative agriculture agreements – where the Service partners with farmers to meet wildlife management goals – permit farmers to grow crops on a refuge to produce more food for wildlife or improve habitat. Prior to 2014, neonicotinoids and genetically engineered crops were regularly used in refuge farming programs. However, the Service banned these harmful industrial agriculture practices because they interfered with naturally functioning ecosystems and healthy wildlife populations the Refuge System was established to protect, until yesterday’s policy reversal.